Securely attributed to Giovan Pietro Birago, the celebrated Lombard illuminator who was a priest from Brescia, this cutting comes from one of the Choir Books completed for the Cathedral of Santa Maria Maggiore de Dom in Brescia between 1469 and 1486 (Brescia, Pinacoteca Tosio-Martinengo). Securely attributed to Giovan Pietro Birago, the celebrated Lombard illuminator who was a priest from Brescia, this cutting comes from one of the Choir Books completed for the Cathedral of Santa Maria Maggiore de Dom in Brescia between 1469 and 1486 (Brescia, Pinacoteca Tosio-Martinengo). A group of eighteen richly illuminated Choir Books was executed over the period of a decade in the scriptorium of the Duomo under the generous patronage of the bishops Bartolomeo Malipier (1457-1464) and Domenico de Dominici (1464-1478). In 2004, Jonathan Alexander published this cutting and identified it as one of five cuttings from the same set of Choir Books (the cuttings are now in Boston Public Library; Kansas, Nelson Atkins Museum; Lonato, Fondazione Ugo da Como; and the collection of William Voelkle in New York). In 1471, Birago signed and dated miniatures in three of these Choir Books, which makes them unique documents of his earliest style. 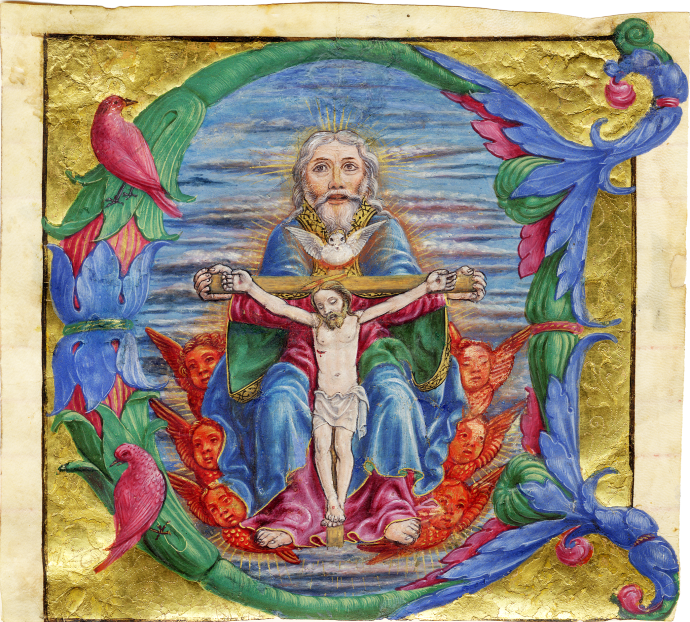 The Trinity shares characteristics with his early signed miniatures and anticipates his later Lombard creations: it presents a robust figure of God the Father holding Christ on the cross surrounded by red-faced cherubim and a subtly modulated blue sky. The ensemble reveals Birago's exquisite decorative vocabulary, his predilection for vibrant contrasting shades of rose, green, blue, and red, his rich ornament, and his delicate tooling in swirling patterns in the gold leaf around the initial. One of the most esteemed artists at the Sforza court in Milan from about 1490 to 1513, Birago also signed several of his late works. In an era of artistic anonymity, few illuminators signed their art with the frequency that Birago did. This detail, coupled with the theft of some of his miniatures from the Sforza Hours (London, British Library, Add MS 34294) by jealous peers, attests to the exceptional renown he garnered already in his own day. Gatti Perrer, Maria Luisa and Mario Marubbi, eds., Tesori miniati, Codici e incunaboli dei fondi antichi di Bergamo e Brescia, Milan, 1995, pp. 164-66; and Jonathan J.G. Alexander, "Giovan Pietro da Birago, illuminator of Milan: some initials cut from choir books," in Excavating the Medieval Image. Manuscripts, Artists, Audiences Essays in Honor of Sandra Hindman, ed. David S. Areford and Nina A. Rowe, pp. 225-246, Ashgate, 2004 (this miniature fig. 10.4).